Below is a letter addressed to Vice Chancellor David Eastwood from BEM students regarding the proposed redundancy of Dr. José Lingna Nafafé. Following the recent news that the College of Social Sciences is proposing that Dr. José Lingna Nafafé be made redundant, as Black and Minority Ethnic students we are sending this open letter to express our concern and anger over this potential redundancy. As BME students at the University of Birmingham, and active members of BME led and related associations, groups and campaigns, we would like to express our discontent over the lack of an equal and diverse environment. Collectively, we believe that many of the issues faced by BME students on an academic and social level are largely attributable to the lack of BME representation within various departments. Dr. José Lingna Nafafé has not only served as an inspirational lecturer and academic, but a source of empowerment in an institution which many of us have felt isolated, marginalised and rejected from. There have been a number of reports which point to the lack of staff representation as having a largely negative effect on attainment and overall integration within HE institutions. José has helped numerous students feel valued and that their input is relevant because their position is equal to that of their White counterparts. Even for students who have not had the privilege of undertaking a module he leads, his physical presence and eagerness to interact with all students has proven that he is invaluable. Furthermore, his approachable character has allowed us to share our concerns and seek guidance from him when we could not find comfort from the other services available. For many of us, particularly home students who know the city of Birmingham to be a diverse and multicultural space, the university served as a culture shock. If José was no longer a part of the university staff, this would further emphasise the University’s disinterest in equal opportunities and again, representation. This would also further hinder the University’s reputation regarding a diverse teaching staff (a recent mention includes the Guardian’s ‘14,000 British professors – but only 50 are black’ where it was stated that ‘Only the University of Birmingham has more than two black British professors’). It would be a catastrophic loss for BME freshers who are likely to face similar trials and feelings of isolation, or even overt forms of racism. Dr. Nafafé’s application of a zero tolerance policy has allowed his classrooms to feel like safe spaces in which to engage, and for some of us this was a rarity given that university staff had not taken action when students were confronted with varying forms of racism in the past. If the University of Birmingham is committed to its students, then having Dr. Nafafé remain as a member of the teaching staff will truly emphasise this. His approaches to teaching, values and dedication to ALL students are no secret, and should be commended. Therefore, we collectively request that you recognise this and believe in the application of equal representation for BME students. We individually believe that Dr. Nafafé has changed our lives and inspired an academic passion which would have otherwise resulted in either leaving the University or attaining lower class degrees. Fearful university bosses losing control – Statement from University of Birmingham Defend Education. University of Birmingham bosses have been responding to student/staff protests regarding the closure of the Institute of Archaeology and Antiquity and to university support staff taking industrial action over pay cuts. Even by their normal standards the conduct of the management has been ludicrously heavy-handed and only solidifies their image of being out of control and out of touch. On the first university open day on Sunday the 10th of June, the university prompted outrage by removing the student paper Redbrick from campus. Thousands of copies of the paper were binned by university staff because they carried a headline article reporting the news of large cuts to several departments which were being advertised to students on the open day. The departments being cut/facing closure are the Institute of Archaeology and Antiquity, the School of Education and Nursing and Physiotherapy. Student open day ambassadors are reporting they have been instructed not to speak of any cuts while giving tours of the departments to prospective students, who will arrive next term to find large numbers of their lecturers being made redundant in their first weeks of university. Support staff at the University of Birmingham earn as little £13,000 a year full time before tax. This year they were offered just 1.2% per year when inflation last year was over 5%, a large real term pay cut. After this the university really twisted the knife by deciding that 16 years’ worth of double bank holiday was an “admin error” and they are abolishing it; effectively cutting pay for support staff by hundreds of pounds a year. In response hundreds of Unison staff have gone on strike and about a hundred Unison members picketed the university on the open days of June 21st and 22nd. Every open day visitor walking onto campus was given a leaflet naming and shaming the university for its treatment of its workers. The university responded harassing picketers with security, pressuring staff to work on the strike days and sending out all staff e-mails against unison. In response to the censorship of the student paper, the VPE along with other students handed out copies of the censored front page, along with a pamphlet supporting the strikers. The university called the campus police to stop the leafleting claiming the material was “libellous” and asked them to arrest the VPE, who then fled into the student union building before more campus police turned up and detained him and radioed their superiors saying they “want to know if we can arrest him,” although the answer was presumably “no” as they then let him go and left. Academics in Royal Holloway in Surrey and Universities in London were reporting this Friday that they had been e-mailed by Mike Whitby the Pro-Vice Chancellor of the University of Birmingham. His e-mail was asking them to withdraw their name from the “Save the Institute of Archaeology and Antiquity” petition. It appears that the university desperately sensitive of its poor public relations is e-mailing every academic who signs the petition in a desperate attempt to put its spin on the closure of the department. Student Union officers remove Birmingham Post from Guild after publication of anti-union propaganda. All copies the Birmingham post were removed this morning from the Guild of Students SPAR shop by several angry student union officials. The Paper was removed after it printed a shameless spin article against the strike action planned by the university Unison branch. The Birmingham post which describes its political alignment as “free market” ran a story clearly attempting to downplay the university’s workers grievances. 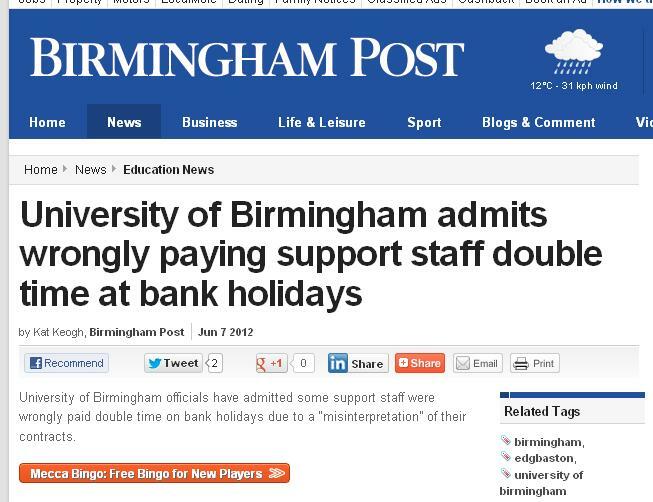 It ran a headline article under the banner “University of Birmingham admits wrongly paying support staff double time at bank holidays”, attempting to portray the planned strikes as against the university trying to fix a “admin error”, that has lead to workers being overpaid. The post claims “It was not known how much the error cost the Edgbaston-based institution or over what timeframe the enhanced payments had been made.” The interpretation of the contracts as giving staff double holiday pay have been in place for 16 years and the post was informed of this by officials however, they made the deliberate choice to selectively ignore this information. They have portrayed it as a sort term “error” rather than serious change in pay & conditions. The article glosses over the facts. It claims that the university has offered support staff a 1.2% pay rise to most worth around £250 pounds. This is true they offered this deal in autumn and while it was not accepted it didn’t result in strike action and was seeming to be going ahead. What the article doesn’t mention is that months after the 1.2% deal was announced by the university, they decided to announce that the 16 years’ of double bank holiday pay had been “error” and would be removed, completely wiping out the 1.2% pay increase previously given during the bargaining. The article attempts to portray the 2000 strong Unison Branch as isolated and extreme at several points by claiming that “other groups of workers had accepted the deal.” By which we can only assume means the non-unionized temporary staff with no collective bargaining schemes in place and who don’t have the chance to reject the offer. The University has betrayed its workers publically offering them 1.2% with one hand a then privately taking this away with another hand by removing long standing holiday pay. There is visceral anger from students, student staff and university workers. We won’t stand by and let the universities actions go without staunch protest and our union won’t play host to rightwing articles that run university PR spin on the strike, attempting to portray the widely supported union as isolated and over a “admin error”. We don’t consider this a issue of free speech, we simply won’t play host to bad journalism and attempts by bias journalists to defame Unison. University of Birmingham Defend Education would like to express its solidarity to the staff at the University of Salford, who have been informed that a further 218 jobs are set to be cut in an attempt to save £7 million. This is in addition to the loss of 150 jobs at the University in the past two years. Many of these job losses have been described by the University as “reorganisation of our professional services”, but the Salford Star maintains that staff will be forced to reapply for jobs and that the figure of 218 job losses remains accurate. Unfortunately these job cuts represent yet another attack on the quality of public education at the point of delivery, the point where it matters; the lecturers that impart knowledge to students, at a time when funds are being diverted towards the beautification of campuses (the University of Salford is spending £50 million on its new MediaCityUK Campus) and the increasing pay of University management teams across the country. As the government push an agenda of privatisation in areas such as education and the NHS, and attempts to marketise and commodify the public university system, it remains imperative that students and staff stand in solidarity nationwide, and the University of Birmingham Defend Education extends their support to the staff at Salford, and to any groups fighting for public education and the preservation of their jobs against the austerity measures of the coalition government. 1. To call for the immediate re-instatement of EMA. 2. To call a national day of walk-outs over EMA in the first term of 2012-13 and do everything possible to help FE students to mobilise. 3. To publish the stories of those who have lost EMA and produce a popular booklet for FE students. – Stop the cuts to courses, departments and jobs: tax business and the rich to fund education. NUS will be organising a national demonstration in the first term of 2012-13 against cuts, fees and privatisation. To campaign against the government’s whole HE agenda, including all private providers, and for a public university system. To fully support UCU’s initiatives against the White Paper. To organise, as a matter of urgency, a publicity campaign on the implications of the White Paper. First of all I want to say congratulations to our VP education, (as far as I know) the only person to be personally commended as a part of NUS policy (402b): “9. To congratulate Edd Bauer, Birmingham Guild of Students VP Education, for his reinstatement following suspension for being arrested at an NCAFC protest” The rest of the policy is a strong affirmation of the right to take direct action and be supported by your union. That NUS should campaign against any attempts to curb the rights to protest in the UK. To launch a campaign highlighting the human stories behind police brutality and the importance of protest rights. To fully support imprisoned students including by supporting the DTRTP “twin with a prisoner” scheme and work with Student Unions, UCU and Universities to ensure those students are facilitated and supported to continue their studies during their sentence and following their release. To work with Student Unions to make sure students know their rights in advance of protests including aiding the distribution of DTRTP/NUS bust cards. That the right to peacefully protest is a human right. That the term ‘protest’ encompasses a myriad of activities and any attempt to give a definition to ‘protest’ is impossible. That any action by a University or Students’ Union to create a list of protocol to determine what protesting is allowed is therefore pointless. 4 of the 6 candidates for NUS full time officer positions were incumbents and were re-elected. Union Development and Higher Education were the most contested positions. The new VP Union Development, Vicky Baars, is a free education activist and, as LGBT officer in NUS for the last two years, has consistently called for NUS to be more active to have stronger stances and to take stronger action. The new VP HE, Rachael Wenstone, was elected on a speech and manifesto strongly emphasizing the need for NUS to stand up for the public university and to try and give students more control over the governance of their universities, she also was calling for a national demo. NUS conference as a representative of the national student movement, has I think come to terms with, and rejected, its absolute failure to inspire serious action in the autumn of 2010. Conference is now advocating strong stances, strong action and strong defence of students who take part in this and are victimised by the police or universities. The question that remains is if the leadership of NUS will live up to their strong mandates and this will require students, including ones from this university, to hold them to account. Next year everyone at the Guild need to draw a line under the fractured weakness that has characterised the organisation over the last year. We all need to get behind the national Demo and have hundreds of Birmingham students out on the streets of London. We all need to think hard about our principles, how do we think universities should be run, and the tactics that can bring this vision about. Conference this year has had a serious debate about what these should be and now needs to unify around what was decided. I hope sincerely that similar debate and similar unity in action takes place on our campus. A full 70 days after the February the 15th Protest Against the Ban on Protests, the university has initiated disciplinary investigations into an unknown number of students in attendance at the demonstration. They have informed them that they “might have breached one or more university regulations” and have summoned the students to meetings to be asked questions. The move has provoked further widespread condemnation of the University for insensitivity in starting such an investigation just as the exam period begins. 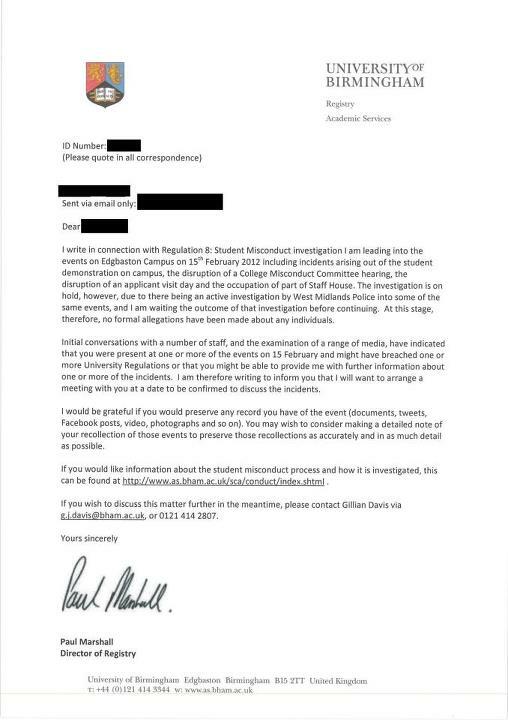 The Chair of the Postgraduate and Mature Student Association even sent this outraged letter to the university stating he was also at the protest and demanded to also be investigated himself. Defend Education think the move is a highly politicised abuse of university procedure to get at protestors. The universities own student misconduct policy states investigations should begin within 10 days of an alleged offense. The idea that the university can simply start an investigation at any time for any event should be rejected as it is extremely unfair on students. A solidarity meeting has been called to organise a defence campaign to make sure no defendant feels isolated or undermined by the investigations into them. Please feel free to come along in support. Defend Education especially encourages all its supporters to attend this meeting.